I’m like you. I phantasize about ideas, about how people would love that idea and give me feedback on it. They will suggest this and that and you will feel grateful about such good tips. Wonderful, so many people loving it. It’s going to be great. Eventually your idea will grow and become more complex. Then the core of your idea has become clouded by „add-ons“, suggestions and advices you received. All the shining elegance and plain simplicity in the beginning turned into a messy heap of ugliness. Who’s going to tidy that up? You will, or you won’t because you lost the lust already to continue. Your Disney castle became a nightmare dungeon because you blew up an idea so that executing it would have been infeasible. You never left the idea stage and pretended you were executing although you were only sandboxing. Your idea never saw a market, the market never saw your execution and your sparring partners never had a chance to box against you because never announced a fight or entered the ring. Plan minimal. Execute big. The barebone idea of what you have in mind needs an execution. If you consider your idea a neat collection of bones arranged as a skeleton then the execution is the flesh, blood and muscles that bring it alive — bone by bone. Having a shaped skeleton is actually pretty advanced since your idea could also only be a single bone. But to make the example easier to understand, your idea is a complete construction but bare with no life. So, ideas are great. I like them. You, too. 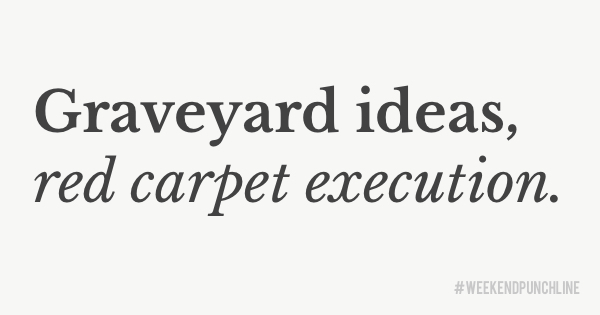 But if you collect your ideas and never execute on them you are creating an ivory graveyard. You will die with it. In the end it is about what you did not how much you planned. Nobody is interested in how it was supposed to be like. Everybody wants to know how it is going (working) — also in every-day conversations. Make sure your answer is „Execution in progress“, not „Idea yet to be fully defined“ — and you can answer less like a robot of course. This was episode 25 of the #weekendpunchline . Every Saturday and Sunday.